Divalent metal transporter 1 (DMT1 also known as DCT1, NRAMP2 or SCL11A2) is a membrane-bound divalent metal transporter which is conserved from prokaryotes to higher eukaryotes. It has been postulated to play important roles in intestinal iron absorption at the brush border of duodenal enterocytes, erythroid iron utilization, hepatic iron accumulation, placental iron transfer, and other processes. DMT1 gene which contains at least four isoforms (1A/+IRE, 1A/−IRE, 2/+IRE and 2/−IRE) is located on chromosome 12q13 in human. DMT1 mediates the transport of a wide range of metals, including the essential metals Fe2+, Zn2+, Mn2+, Cu2+, Co2+, Ni2+ and toxic metals such as Cd2+ and Pb2+. The intention of this study is to determine that IVS4+44C/A single nucleotide polymorphism in DMT1 gene of Turkish population. For this purpose blood samples from 192 female and 192 male volunteers were analyzed. 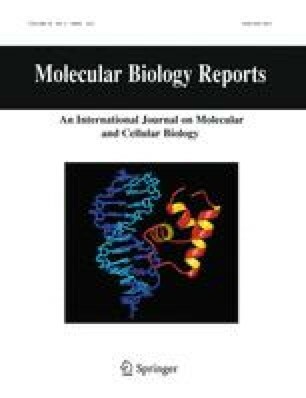 DMT1 gene was amplified with the polymerase chain reaction-restriction fragment length polymorphism technique and 351 bp oligonucleotide was produced. The amplified oligonucleotides were cut with MnlI restriction enzyme according to their polymorphic characteristics. Digested and undigested products were separated on a 2% agarose gel electrophoresis, visualized by ethidium bromide staining under an ultraviolet illuminator. The genotype frequencies of DMT1 IVS4+44C/A polymorphism were determined as 47.9% for CC, 40.1% for AC and 12.0% for AA genotypes. The frequency of the C allele was found to as 68.0% and of the A allele as 32.0%. The genotype frequencies were consistent with Hardy–Weinberg equilibrium (χ2 = 2.394; Exact P = 0.128).